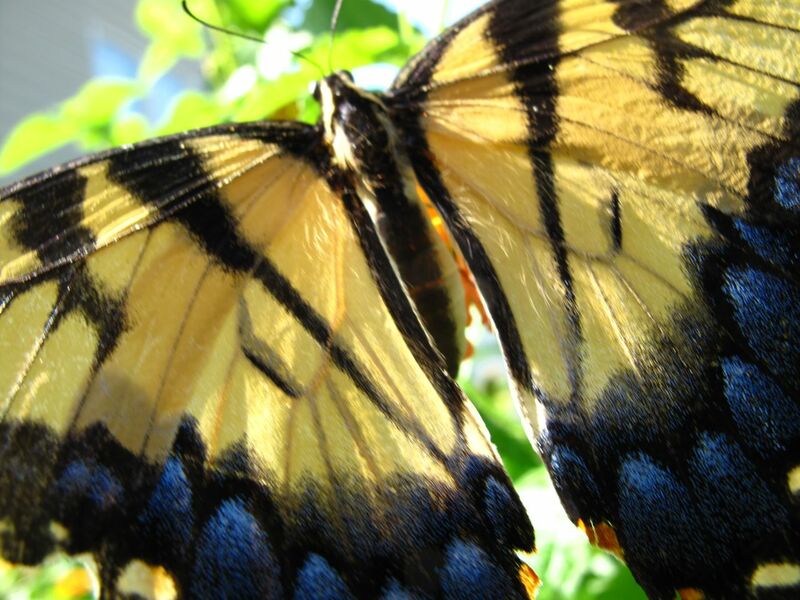 A beautiful butterfly (lovely photos!) and a pretty flower too. I love lantana as it is pretty robust, even in the heat. Thanks Cathy. I was really delighted with seeing this butterfly–haven’t seen very many this year. Thanks Christina! 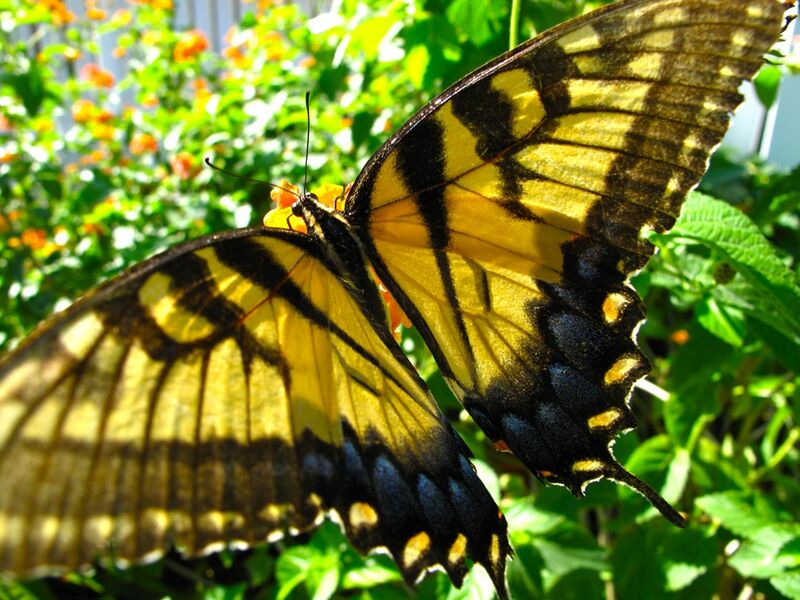 I was able to find pictures of the Scare Swallowtail–it is an interesting one. Bet the white lantana is very fine. I would like the white. I’ve seen a lot of new colors introduced lately (mostly too pastel for my preference), and I may be wrong but I don’t think the newer hybrids are hardy in my area. This lantana is 11 years old and gets to be about 4 feet tall and maybe 5 feet wide, bigger than I’d planned. 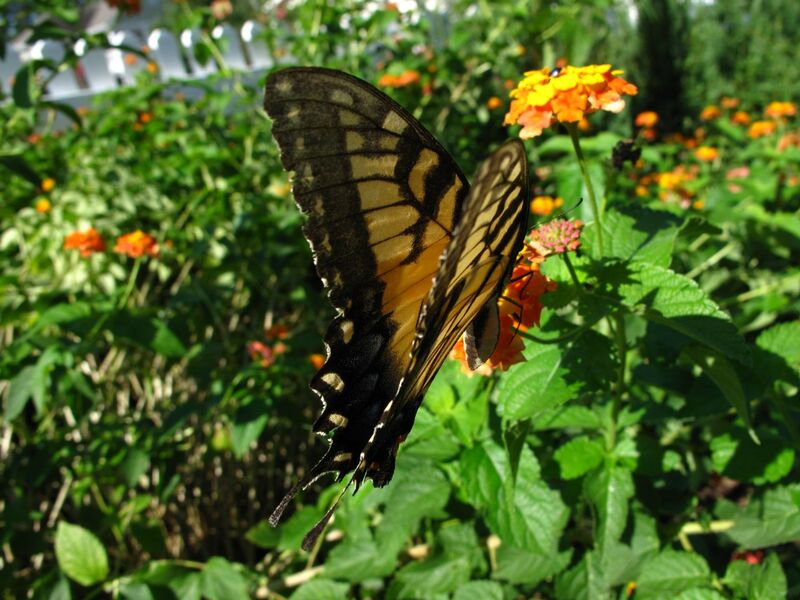 You sure got some great photographs of the swallowtail. It is also in good shape. The last one through here was so battered I don’t know how it stayed in the air. You garden looks nice and green for such a dry year. Thanks Sandy. I was chasing that butterfly all over the place. The last one I’d photographed was tattered and torn, so it was nice to see one in good condition. After long periods of no rain we are now getting strong, frightening storms several times a week. The garden still looks pretty much past its prime but a few things are greening up again. The lantana was brown and dry with no blooms a few weeks back, so I’m happy it is going strong again. Beautiful butterflies. Thanks for sharing. We don’t have these in the UK sadly. Thanks. Not too many butterflies this year in my garden. How about yours? 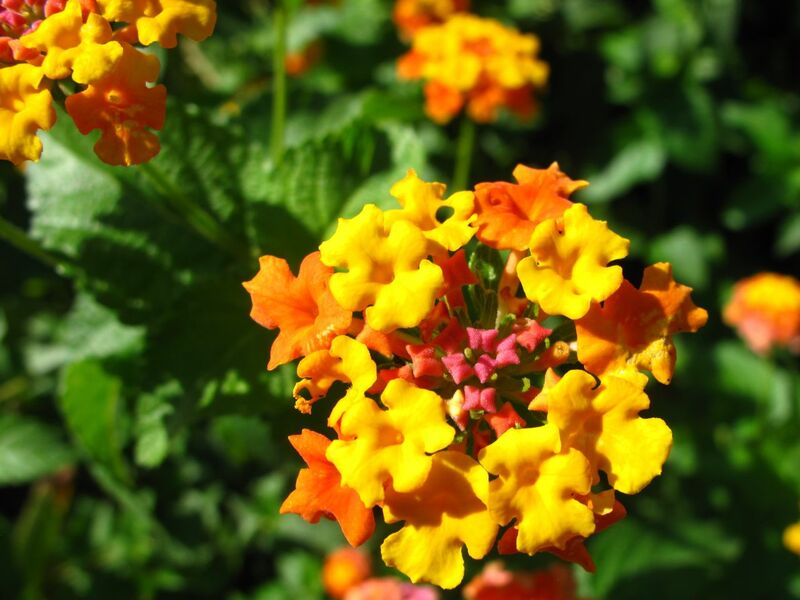 Lovely Lantana! It’s great that you can grow them in the garden and it grows to 4 feet tall. Mine have to stay in the pots and be confined in the basement in winter. I can’t vouch for the drought tolerant but they are hard to kill. They also do pretty ok with minimal light. They bloom in the basement all winter, not profusely as when they are outside but never stop blooming. That’s an amazing way to grow Lantana.